The match shall begin with the flip of a coin between the capos (captains) from each team. The winner of the coin flip may have the first toss of the pallino or choose the color of the balls. A player may toss the pallino any distance so long as the pallino passes the center line of the court and does not hit the back wall. If a player fails to validly toss the pallino after one attempt, the opposing team will have a chance to toss the pallino and put it in play. If the opposing team fails to toss the pallino past the center line the pallino reverts to the original team. In any case, when the pallino has been properly put in play, the first bocce ball will be thrown by the team who orginally tossed the pallino. The team who originally tosses the pallino, whether successfully or not, throws the first bocce ball. If the bocce ball hits the back board, that team must roll again. Otherwise he/she steps aside and his team does not roll again until the opposing team has either gotten one of its bocce balls closer to the pallino or has thrown all of its balls. The team whose bocce balls are closest to the pallino is called "inside" and the opposing team "outside." Whenever a team gets inside, it steps aside and lets the outside team roll. The team outside throws until it beats (not ties) the opposing ball. This continues until both teams have used all their bocce balls (a total of 8, 4 from each team). The team who scored last, throws the pallino to begin the next frame. A) If a player rolls the wrong colored ball, simply replace it with the correct color when the ball comes to rest. B) If a player rolls out of turn the opposing team may leave everything, including the thrown ball, exactly where it is or may return any moved balls to their approximate original positions and remove the thrown ball from play. C) If a ball is moved before all 8 balls are played, the opposing team replaces the ball to the approximate original position. This is to be done in the spirit of good sportsmanship. D) When a team wins a game players exchange ends of the court and substitutions may be made. The team winning the previous game will toss the pallino to start the next game. E) Practice between games is limited to rolling up the court and back on time. Should a player's bocce ball make contact with the back board the bocce ball is considered a dead ball on impact and is removed from play until the end of the frame. A) If the thrown ball comes to rest on the pallino or another ball that is touching the back wall, that thrown ball remains in play. The ball touching the back wall is removed from play. If the pallino is touching the back wall it remains in play. B) If a bocce after hitting the backboard strikes a stationary bocce, that stationary bocce shall be replaced in it's original position. The thrown ball is removed from play. C) If a bocce hitting the backboard is not removed quickly enough and, as a result, strikes a moving ball that likely would have hit the backboard, allowing the moving ball to remain in play, that moving ball remains in play where it comes to rest. Once the pallino has been validly put into play, it remains in play even if it hits the backboard. However, if the pallino is knocked out of the court or it is knocked in the front of the center line, the frame will end, no points are awarded, and the game will resume from the opposite end of the court with the same team tossing the pallino. Player's movements are limited to the foul line. The player may step on, but should not step overthe foul line before releasing the pallino or bocce ball. If the intent of the foot foul rule is abused, the offending player may be removed from the game by a director of the Martinez Bocce Federation. When a player releases the pallino or bocce, both feet must be on the court unless the player has a significant plysical impairment. Shooting is lofting the ball in the air beyond the center of the court. Shooting is allowed if the thrown ball hits the ground before hitting the ball. If the thrown ball does not hit the ground first, everything goes back to its approximate original position. The thrown ball is out of play. The teams playing will referee their own game. Any dispute which cannot be resolved by the team capos shall be decided by one member of the Martinez Bocce Federation Board of Directors agreed to by both capos. Upon his/her decision the game shall continue.Reviews of any disputes will be handled in a fair and speedy manner. Only the "inside" team scores. One point is given for each ball of the inside team that is closer to the pallino than any ball of the opposing team. If at the end of any frame the closest ball of each team is equidistant from the pallino, the frame ends in a tie and no points are awarded to either team. The game will resume from the opposite end of the court with the same team tossing the pallino. Capos of each team are responsible for keeping the score sheet and for reporting the results of the match. The team who scores 12 points wins the game(must win by 2 pts). All measurements should be made from the inside dimensions of the bocce ball to the inside dimension of the pallino. Only an official and one representative from each team may be present for the measurement. If both teams agree on which team has the point(s) and it is later determined that a mistake has been made, all balls played are valid. If both teams have balls remaining, the team that does not have the closest ball to the pallino rolls again. 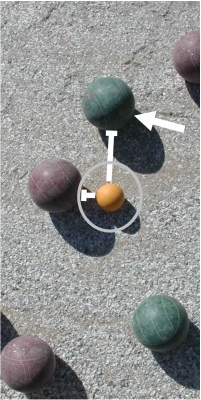 If all balls have been played, points are awarded based on the balls that are actually closest to the pallino in accourd with the "Scoring" rule. If a team forfeits any three matches, they will be dropped from league play and the team capo will be notified by mail. All games previously played will be null and void. Games may not be rescheduled unless both capos degree. All rescheduled games must be played no later than one week after the originally scheduled date. If the Federation "Commish" determines the games must be cancelled due to rain, those games will be rescheduled as determined by the Fedation "Commish." A) All completed rosters must be turned into the Federation before the deadline. The deadline is the teams scheduled third game. B)No more than 10 people maybe on the roster and no less than 6. A person can only play on one team in the open league. A team forfeits any game in which they play a non-roster player. The opposing team may not waive non-roster player forfeits. C) If a team fields less then 2 players, the game is a forfeit. A 2 or 3 member team may play throwing only 2 balls per player. A 3rd or 4th player arriving late may enter the game after the completion of the frame. D) There is no minimum age limit, however no more than 1/2 of the team may be under the age of 18 and at least one person in ever game must be 18 or over. E) A team may make one substitution per game. Substitutions may only be made between frames. F) No player may play two consecutive games from the same end of the court. G) Players need not alternated throws. Consecutive or alternating throws by teammates shall be at the option of the players. A) Team capos are responsible for the actions of their players. B) If a player is standing in the playing half of the court while the opposing team requests that the player step aside, that request should be honored. C) Only participating players should be on the court while the game is in progress. Spectators are not allowed on the courts at anytime during regulation play. D) Courtesy and respect should be displayed at all times. Profanity and unsportsmanlike conduct is not permitted. Violations may result in a warning by a ruling official to the player and team captain. Severe violations or a violation after a warning may result in the players expulsion by the ruling official from the game or match. E) All trash, pop tops, cigarette butts, etc. are to be discarded in appropriate containers. F) Bike riding is prohibited on or around the courts. If you are building a new court and are low on funds you could get a loan from Titlemax. A car title loan from Titlemax can help you get cash quickly. I want to thank the Martinez Bocce Federation for providing the above rules of Bocce.